Roy Moore supporters allegedly approached the attorney of one of his accusers and tried to convince him to discredit his own client. Phone calls and text messages reveal the supporters offered $US10,000 to persuade the attorney representing Leigh Corfman, a woman who accused of Moore of initiating a sexual encounter with her when she was 14 and he was 32. That revelation was followed by several other accusations of sexual misconduct during a contentious special election for an open US Senate seat in Alabama last year. The scandal surrounding Moore derailed the Republican candidate’s campaign. Doug Jones won the election, becoming the first Democrat to claim a Senate seat in deep-red Alabama in more than two decades. Two supporters of Roy Moore, the former Republican candidate who ran for a US Senate seat in Alabama, reportedly contacted the attorney representing one of his accusers and offered to pay him to discredit his own client, according to a Washington Post report published on Friday. Attorney Eddie Sexton represents Leigh Corfman, who accused Moore of initiating a sexual encounter with her when she was 14 and he was 32. 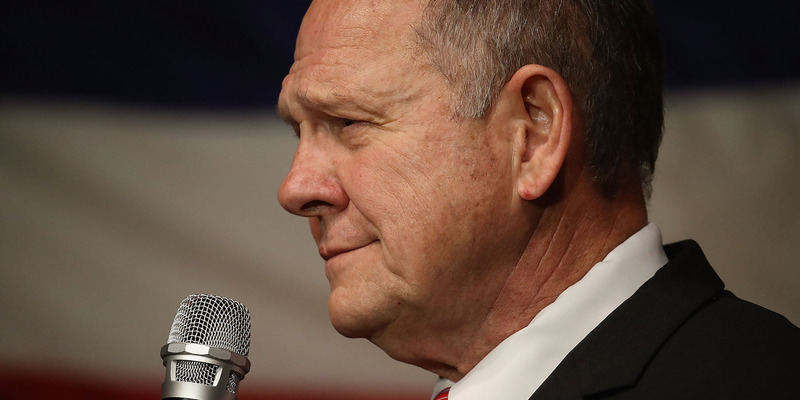 Moore faced a number of sexual misconduct allegations during his campaign for a Senate seat in Alabama last year. 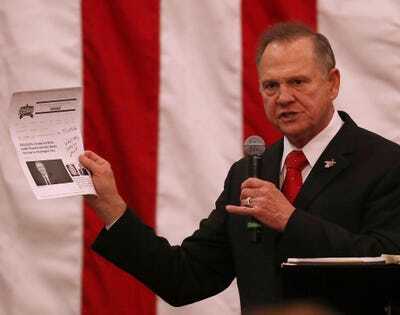 Sexton claimed that two of Moore’s supporters asked him to drop Corfman as a client and publicly state that he did not believe her allegations against Moore, according to The Post. The supporters reportedly offered to distribute Sexton’s statement to Breitbart News, the newspaper said. The supporters said they would pay Sexton $US10,000 to cooperate, and would introduce him to Steve Bannon, who led Breitbart at the time, as well as other people in Washington, DC. Sexton’s account was reportedly corroborated by recorded conversations, text messages, and other people he told, according to The Post. “We got some chance to do something, make some quick little-bitty for you … and then, on down the line, we can go to D.C.,” Lantrip said according to The Post. Lantrip’s alleged comments apparently implied that, by effectively renouncing his client, Sexton would cast doubt on other women who accused Moore of sexual misconduct. Lantrip reportedly attended rallies for Moore, but was not involved in an effort to compensate Sexton and was not authorised “to do such a thing,” according to a statement from Moore. Lantrip and Bert Davi, another associate, did meet Moore, but “did not have any special access” and were not “ever commissioned with any special tasks,” the statement continued. Though Lantrop did not comment on Sexton’s account of compensation, he did acknowledge that he said Sexton would receive legal work from Bannon. “I’ll protect what I did, because I know I didn’t do nothing,” Lantrip said, according to The Post. Moore lost to Democratic Sen. Doug Jones with 48.4% of the vote to Jones’ 49.9%, making Jones the first Democrat to hold a Senate seat in Alabama in more than two decades. He was sworn in on January 3. Moore still has not conceded the race.